We all like tasty fried food, nice crispy fish, yummy pancakes or awesome homemade Granola. Unfortunately all these delicious recipes need oil (at least in my book). I have two kinds of oil in my kitchen, Coconut oil for cooking and baking and Olive oil for dressings and anywhere else I would use cold oils. →There is neutral tasting Coconut oil for those of you worried about coconut taste with your potatoes. Neutral Coconut oil can be used for any recipe and won’t taste like coconut at all. 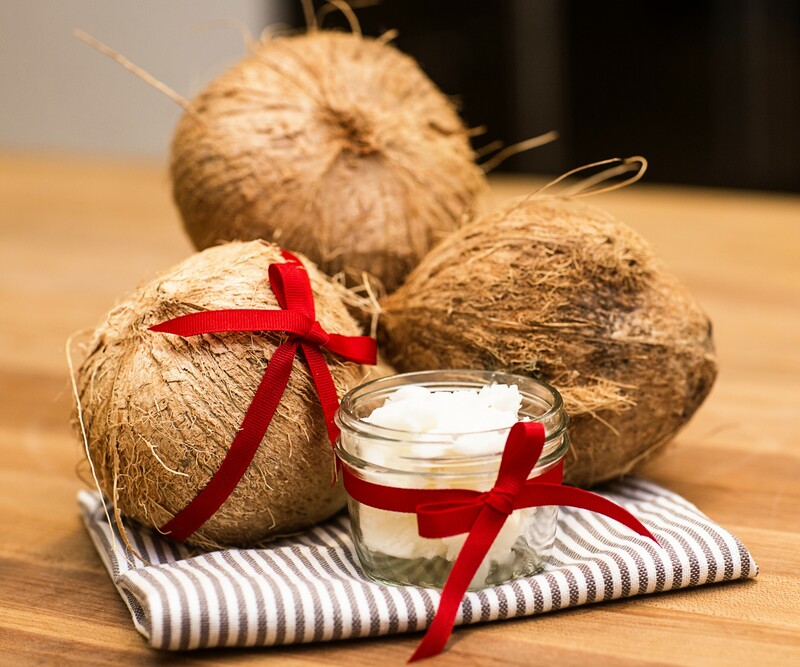 Coconut Oil is better suitable for us because the saturated fatty acids do not become rancid (toxic) when heated compared to unsaturated fats like Olive oil. Coconut oil is a rich source of medium-chain fatty acids (short MCT’s). MCT’s are well soluble in water. From the start they are basically on a fast track to your liver where they are transformed into energy for your brain, heart and liver also known as ketone bodies. In addition Coconut Oil consists of Lauric Acid which occurs in Breast Milk (uhm yes). This kind of oil is obviously very familiar to our body and is because of it, very well absorbed and transported. I could go on and on why coconut oil is so awesome but the most important factor for me is the non rancidity = toxic factor of it compared to other oils when heated. Additionally it is (in moderation like all oils) good for you and the neutral coconut oil does not taste sweet or like coconut at all and can be used for all recipes. Olive oil on the other hand is a unsaturated fat and becomes rancid at 350°F (170°C). How hot is an average frying pan? Let’s just say it goes from a low 250°F (121°C) up to 500°F (260°C). →Olive oil cold is an awesome and tasty fat. Just don’t heat it up! Kokosfett ist besser für uns als andere Fette weil die gesättigten Fettsäuren im Vergleich zu ungesättigten (Olivenöl) nicht ranzig oder giftig werden, wenn erhitzt. Zusätzlich besteht das Kokosfett aus Laurinsäure welche in der Brustmilch vorkommt. Dieses Fett ist unserem Körper also bestens bekannt und kann dadurch sehr gut verarbeitet werden. Olivenöl wird bereits ab einer Hitze von 170°C ranzig und die gängige Kochtemperatur liegt zwischen 120°C und 260°C. Meine Regel ist simple, ich esse kaltes Olivenöl und koche mit neutralem Kokosfett. →Ich kaufe neutrales Kokosfett für meine salzigen Speisen, damit diese nicht nach Kokosnuss schmecken.